Pakistan would be of immense significance for the forthcoming FIFA World Cup football for the country popularly known as the “cricketing nation”, would be exporting soccer balls for the world’s most watched sport this year. Despite ranked 159 by the ruling body FIFA, Pakistan’s presence would be huge this time. The country won’t be among the 32 teams to play the world cup; but it would join China as a key supplier of official Adidas AG (ADS) World Cup balls, manufacturing more than 3000 Brazuca balls to be used for the one month long football tournament kick starting on June 12th. According to a report in “Express Tribune”, the Chinese company Adidas couldn’t meet the demands of soccer balls in Rio de Janeiro, Brazil, due to which a ball manufacturing company in Sialkot, north eastern region of Punjab province, obtained the contract to supply the balls. 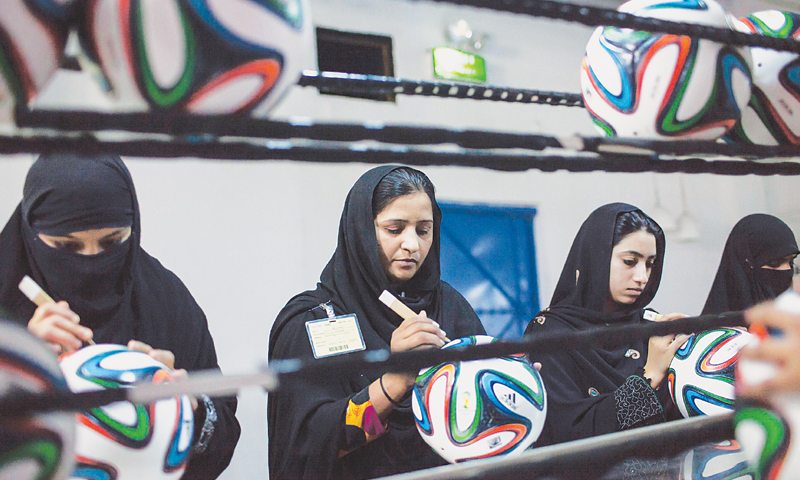 For Khwaja Akhtar, the factory owner, it was a dream come true.. His company Forward Sports, which is his family business, has manufactured balls of several grades for German Bundesliga, French league and the Champions League before. Akhtar’s company presently has 1,400 employees, a quarter of them being women, some wearing the niqab and the others clad in bright and colourful clothes and jewellery. Sialkot was once an unbeatable soccer ball production capital of the world until the 1990s, exporting more than 30 million balls a year, an estimated 40 percent of global production. But India and China have caught up recently. According to a research by senior lecturer Khalid Nadvi of the University of Manchester, Peter Lund-Thomsen, associate professor at Copenhagen Business School, Pakistan lost business to China in 2006-09, dropping almost half its global share to 13 percent. China’s rose to 50 percent from 35 percent. Sialkot also produces Nike Inc. (NKE) sports gloves and Slazenger hockey sticks. Argentina’s 1986 World Cup-winning captain, Maradona, recently taunted Pakistan’s soccer credentials, saying that the Argentine soccer chiefs knew even less about the sport than the people of the south Asian country. “I’m sure people in Pakistan are good at a lot of things, but I never saw Pakistan play in the World Cup finals,” he said. Pakistan has given the answer by being an important part of the World Cup match through the distribution of the soccer balls after a gap of more than ten years. Brazil, in December 2013, had unveiled the latest soccer ball for the 2014 edition, the Brazuca, on the official FIFA World Cup website. The Brazuca with its new design and new panel system has got six identical interlocking panels making up its synthetic surface, thermally bonded to keep out moisture. Thermo-bonded match balls are of top tournament quality.